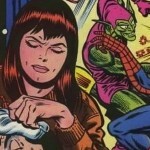 Looking back through my Spider-Man back issue reading journey, I am discovering for myself the contribution each writer and artist had in bringing the Spider-Man look and tone out of the Silver Age, through the Bronze Age and into the Copper and even Modern Age of Comics. One of the main things I noticed, and of which I will be elaborating, is how much Todd McFarlane’s run on Amazing Spider-Man overshadows other important runs, and how much Spectacular Spider-Man ran the stories that would fit much more the original “core” title. A panel from Spectacular Spider-Man #120, demonstrating its great pacing, art and features a modern spider-man look with very prominently large, white eyes. 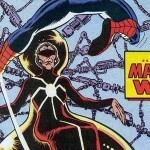 One the aspects of a modern Spider-Man look, of which many associate with Todd McFarlane, is his prominent, big white eye (or eyeholes). Yet, while reading through my collection, a particular issue, Spectacular Spider-Man #120, I was pleasantly surprised to see this very early feel of that modern take on Spider-Man. 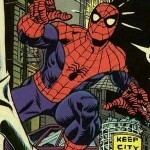 In this one-off issue, socially conscious issue, Spider-Man and Peter Parker confront the New York city housing issue. I was pleasantly surprise by not only the strong artwork, but the pacing, which focuses much more on movement than words, while still managing to tackle an important issue. 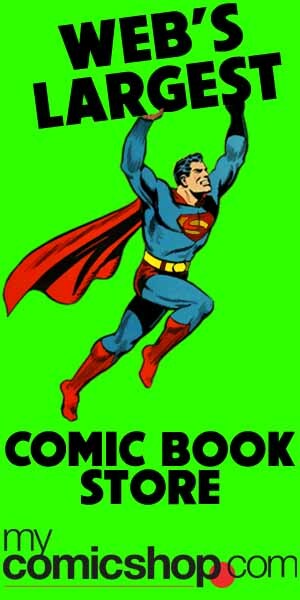 The story was by Bill Mantlo and the art by Keith Giffen. While McFarlane has contributed greatly to modernizing the Spider-Man look, maybe not all the elements reside solely in his court. 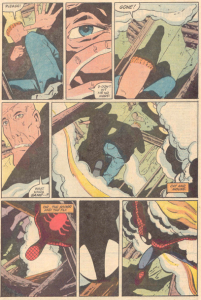 Regardless if history considers this issue a major developmental block in creating the modern Spider-Man look, it is an appearance of a more slender, acrobatic, “big-eyed” Spider-Man look that appears before Todd McFarlane’s celebrated run. This issue might not be essential reading in terms of continuity, but it’s story, art and pacing make it a great issue to pick up without breaking the bank. 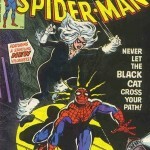 Follow all my modern Spider-Man look musings through the Spider-Man back issue category on this blog.